Coupon use is welcomed by University Air & Heating. Seasonal operational checkouts before air conditioning startups and before furnace startups will increase your safety, energy maximization, and equipment life. During summer checkups air conditioning units are cleaned, checked for proper freon charge, checked for specified electrical circuit operation, and checked for overall performance. Safety's, connections, vents, electrical circuits, and general furnace operations are checked during winter checkups to assure family safety. Your comfort experience will benefit from University's coupon use. Summer coupon discounts encourage our customers to save on service calls, on long summer operating costs, and on unexpected repairs. 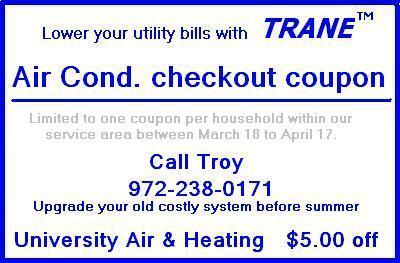 Coupons help University Air & Heating by spreading our work load over several more months. Coupons are a win-win situation. Winter furnace checkouts ensures your family's safety. Checkouts should be done each and every year. If you have had roof repairs, absolutely have your furnace checked for venting integrity.